Teething usually begins when an infant is between four and eight months old, but the timing can vary, according to Drugs.com. In rare cases, teeth can be present at birth. For some babies, signs of teething can begin long before a tooth comes through, while other infants might not appear to have any symptoms. Parents might struggle to understand how to comfort a child during teething, as the side effects can be hard to discern. The good news: Infants are resilient, and they'll soon forget teething's side effects. It may not be so easy for parents to forget, however. An infant might show several symptoms of teething many days, weeks or even months before a tooth pops through the gum's surface. Your infant may begin drooling more than usual with no other signs present. Drooling early in life is common and also might be attributed to a lack of control of the tongue. Infants can swallow, but it takes time to learn how to handle the saliva in their mouths. Drooling can also cause coughing due to the excess saliva running down the throat. Your child could develop a red face rash caused by the skin being wet for long periods of time from excessive drooling. 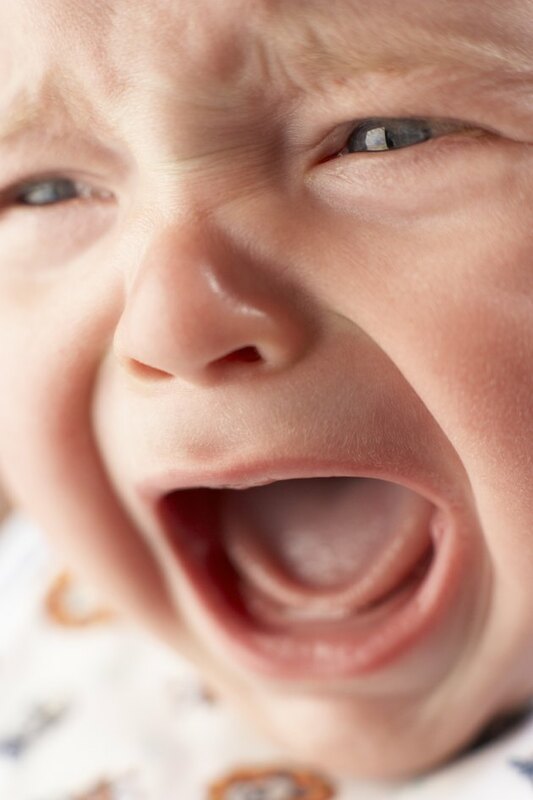 An infant could become unusually irritable, fussy and experience unexplained night waking around the time he begins teething. Without other, easier to recognize signs of teething, a parent might be unsure of the cause for these behavioral changes. One moment an infant might seem extremely unhappy, but within a few seconds she is perfectly fine. These mild behavior changes could indicate that teeth are making their way to the gum surface. At this point, there still might not be any physical signs of teething. Your infant could experience a decrease in appetite caused by the pain in her mouth. It is also common for an infant to begin sucking or biting more than usual. There may be a cyst or bulging, blister-type bump on the gum where your infant is getting a tooth. Typically, the first teeth to come in are the bottom center ones, followed by the top center teeth. After that, an infant's teeth usually fill in, moving from front to back and alternating between top and bottom. The pattern of cutting teeth varies for each child. Some children get several teeth at a time. Often, you can see an outline in the gums of the tooth that is coming through, according to DrSears.com. Parents can confirm that a tooth is to blame for all the unusual side effects by using a clean finger and feeling around the gums. A hard spot might indeed be a tooth. Be warned: Your infant might try to bite down when your finger is in her mouth. A runny nose and a fever are often reported by parents when a child is teething. However, according to BabyCenter.com, there does not appear to be medical evidence to support that these are signs of teething. BabyCenter.com recommends visiting your pediatrician if cold symptoms occur in an infant. DrSears.com suggests that these symptoms do occur during teething and may be the result of gum inflammation. Your child also might rub her cheek or ears, pull her hair, or rub her face into things in an attempt to soothe her gum pain. New Parents Guide: Is My Baby Teething? How Long Before You See Teeth Once Teething Symptoms Start?